Thousands of excited customers lined up at sampling booths located in selected malls nationwide for Chowking’s #BuksanParaMalaman challenge, to try out the Chowking Chunky Asado Siopao. They tasted the hot and soft siopao and discovered just how chunky at asadong-asado it truly is. 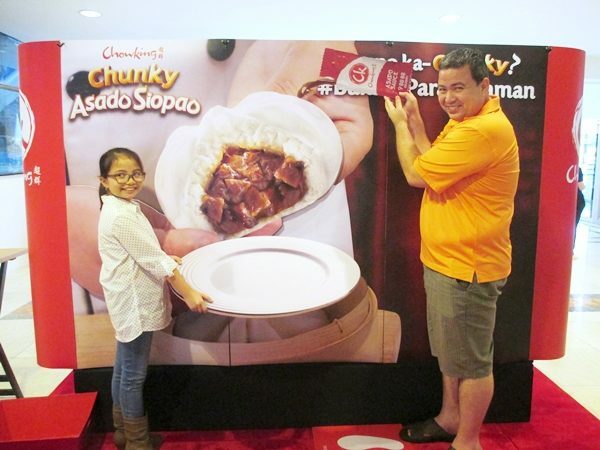 To complement their delicious surprise, a trick art station was set up and customers were able to have their creative and interactive photos taken with the giant Chunky Asado Siopao photo wall. Customers playfully posed at the trick art station to capture their delicious encounter with the Chowking Chunky Asado Siopao. Customers were excited to open their Chowking Chunky Asado Siopaos to discover the true taste of a meaty, asadong-asado siopao treat. Feel like you missed out on this experience? There is a free in-store sampling of Chowking Chunky Asado sioplets—mini siopaos with the same chunky and asadong-asado filling—in selected Chowking stores on November 28. Mark your calendars so you too can take the #BuksanParaMalaman challenge.